Kathryn Mary Lohre, Assistant to the Presiding Bishop of the Evangelical Lutheran Church in America and Executive for Ecumenical and Inter-Religious Relations & Theological Discernment will keynote Lutheran Day of Advocacy 2019 — Set a Welcome Table — to be held May 20 in Harrisburg. Lohre will offer a vision of what it could mean to live into the proposed Declaration of Inter-Religious Commitment, to be considered at the 2019 Churchwide Assembly. She will also lead a conversational workshop around the wisdom and work that went into the proposed policy statement. The day includes worship, workshops on a range of policy issues, legislative visits, breakfast, lunch and a celebration of advocates from each synod. It follows an interfaith day of service, learning, prayer, and public witness in the capital city the day before. Learn more and register. “Although we equip disciples for advocacy on a host of issues, part of our goal this year is to learn to set bigger, more welcome, tables in our lives, congregations, communities and Commonwealth,” said LAMPa director Tracey DePasquale. “It is part of our work to help disciples live into their baptismal call. 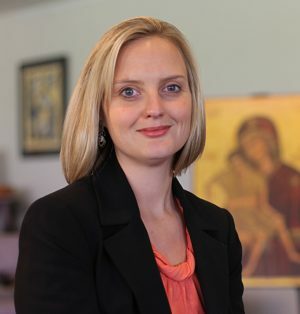 From 2012-2013, Lohre served as president of the National Council of Churches USA, the first Lutheran and youngest woman, and edited the book For Such a Time as This: Young Adults on the Future of the Church (2013). Prior to that, she served as assistant director of the Pluralism Project at Harvard University, Dr. Diana Eck’s research project on religious diversity in the United States. She was a Consulting Editor for Engaging Others, Knowing Ourselves: A Lutheran Calling in a Multi-Religious World (2016). She is currently co-chair of the executive committee of the Shoulder to Shoulder Campaign: Standing with American Muslims, Upholding American Values, a US-based, an inter-religious coalition to end anti-Muslim bigotry.